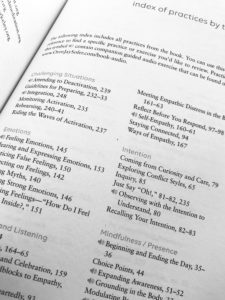 Say What You Mean: A mindful approach to nonviolent communication (how to find your voice, speak your truth and listen deeply.) by Oren Jay Sofer, published by Shambhala Publications, Inc., 2018. I’ve always been fascinated by the art and science of communication; the many ways it is done, how it is received, how it is processed. Say What You Mean adds another layer to that study; the importance of mindfulness in our communication practices. What I appreciate most about this book is that it is not simply a book to read and put on a shelf. It is a book to use; it’s a study guide, a practice book, and a communication reference to come back to time and time again. In fact, the end of book resources add greatly to the this ongoing and active learning. There is a glossary of terms, another of related notes by chapter, a summary of key principles and a detailed index. Another index, practices by topic, provide a quick reference when we need a practice refresh. For example, under the Empathy topic, there are ten practices, including Gratitude, Joy and Celebration, Identifying Roadblocks to Empathy, Listen Wholeheartedly, and others. End of book helpful tips also include a listing of useful communication phrases. For example, if you want to redirect a conversation, what are some effective ways to do so? Another helps the reader with some productive ways to say no (we can all use that one, right?). Each of these sections is organized into chapters by subtopic and each subtopic includes practices to help us grow. Each chapter ends with a summary of key points for review and a question and answer section. Many of the questions come directly from people who attended workshops with the author. Numerous practices are also noted with an icon that directs readers to the author’s website, where audio recordings and a book-specific video enhance the learning. The writing and study is both comfortable and challenging, intellectual and down to earth, thought-provoking and action-based. 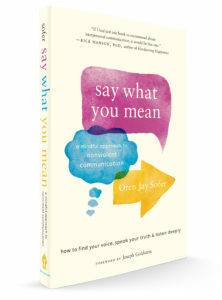 If you want to improve your communication at home or at work, one-on-one or in groups, or if you teach or coach others about communication, this book is for you. And, as yet another bonus, if you order the book from the author’s website, several bonus gifts are available as well, including an email follow-up series and mindful meditations. Let me end by saying what I mean: buy the book! Note; A copy of this book was given to me at no charge. In no other way was the content of this review influenced, written, edited or suggested.